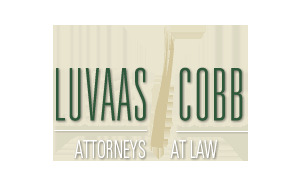 The law firm of Luvaas Cobb traces its roots to 1946 when John L. Luvaas, a University of Oregon law school graduate, opened a general practice law office. Ralph F. Cobb later joined him, launching their law partnership on July 1, 1955. Two years later Joe B. Richards became a law partner, followed by Robert H. Fraser in 1966. The firm became known as Luvaas Cobb Richards & Fraser and maintained that name for almost four decades before being shortened to Luvaas Cobb in 2005. One of the oldest continuous law firms in the city of Eugene, Luvaas Cobb moved to its present location at 777 High Street in 1970 and has expanded its offices there over the years to accommodate the addition of new lawyers and a growing staff. In 1978 the firm became a professional corporation and today is a full-service law firm. While the initial partners all did a variety of legal work, they distinguished themselves as litigators — insurance defense, plaintiff work, construction litigation and public corporations formed the core of the firm’s early work and solid reputation. In 2002, George A. Burgott and Lann D. Leslie, formerly of Butler Burgott & Leslie, joined Luvaas Cobb as shareholders, bringing with them a significant insurance defense practice. In the fall of 2013, after 26 years with the firm, shareholder Joel S. DeVore was appointed by Governor Kitzhaber to the serve on the Oregon Court of Appeals. Now in its 59th year of practice, the firm engages in general practice with nine shareholders, three Of Counsel attorneys, and one associate. The member attorneys specialize in particular areas of law such as business, commercial, estate planning and probate, taxation, real estate, communications and media, employment, personal injury, construction law, elder law, intellectual property, non-profit organizations and charitable giving, and domestic relations. The firm is respected statewide for its strong litigation department. Luvaas Cobb is also widely recognized for its representation of public corporations, particularly school districts, representing some eighteen districts throughout Oregon, including Eugene 4J. Over the years, individual members of the firm have earned statewide recognition for excellence in business, commercial, tax and employment law, and are frequently asked to speak on these topics at professional education seminars. Our attorneys are active in the community, lending support in diverse areas of service through numerous service organizations and state governmental agencies, including Sacred Heart Hospital, the Eugene Airport Commission, Eugene Junior Achievement, the Oregon Environmental Quality Commission and the Oregon Water Policy Review Board. Several attorneys have served on the Oregon State Bar Board of Governors, the Oregon State Bar Board of Professional Responsibility and in specialty Sections of the Bar. 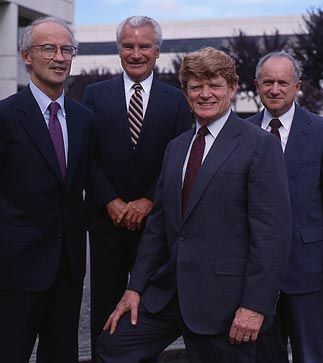 In October 1991, Robert H. Fraser concluded a year of service as President of the Oregon State Bar for the 1990-91 term. Among the firm’s attorneys are four former presidents of the Lane County Bar Association, two former presidents of the Eugene Chamber of Commerce, and a former three term representative in the Oregon Legislature. This active involvement reflects the commitment of Luvaas Cobb to the community in which it had its beginnings — and where it plans a thriving future.